Dotted manicures are easy, quick, and often impressive despite requiring minimal effort! I was excited to do this day of the challenge because I knew I would be able to knock something out in an hour or so maximum, but it would still look neato. I started with a base of China Glaze Dandy Lyin' Around. It's not the most opaque shade, needing three coats, but it has a lovely soft quality and a beautiful shimmer. Then, using three sizes of dotting tools and a rhinestone picker (more on this at the end of the post), I applied four different types of dots to the surface of the nail for a sort of pointilist/mosaic effect. I used three different colors for the dots: China Glaze Too Yacht to Handle, Sally Hansen All Fired Up, and Sally Hansen Black Out. There's something so wonderful about red and teal together, isn't there? It's one of my favorite color combinations. This is the rhinestone picker that I used to create the largest dots. I got it in an Amazing Shine nail art kit a long time ago. I didn't like using it as a picker because it is too big and imprecise, but it does make a wonderful stamp for big circles. 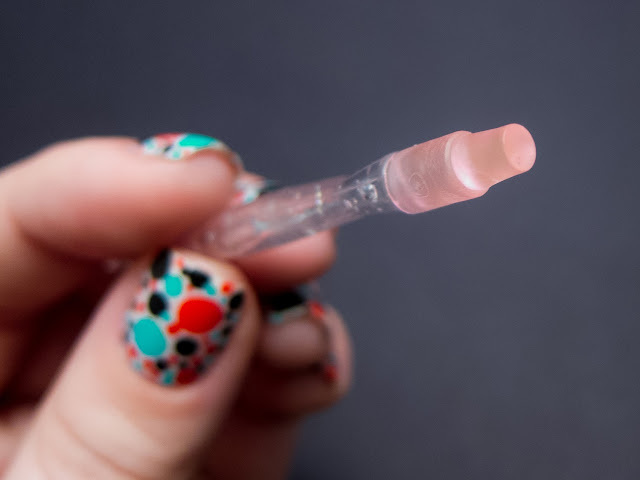 If you don't have one of these, I'd try using a pencil eraser for a similar effect! I can't guarantee it will work because I haven't tried it myself, but in theory it would work the same. My polka dot nails from 2012! My polka dot nails from 2011! I could stare at this forever. Very cool. 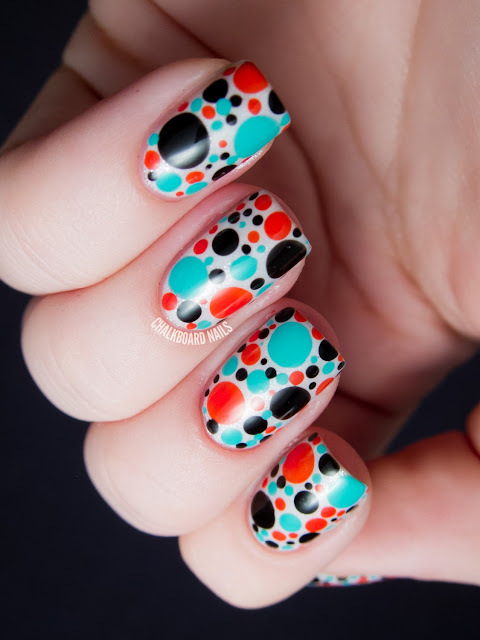 This dotticure is awesome and different from others i have seen. Inspiring! This is awesome! The colors, the dots, all of it! This is so punchy and vibrant, very cool! I Love that color mix!!! great color combo! i may have to "borrow" this palette! also - an eraser DOES work good for bigger dots, as does the opposite end of a paintbrush. I love the retro feel of this! Very awesome! My goodness this is HOT! Woah, I looooove the large dots! So cool! freebies!! !Big brands giving away 100 packets with free beauty products,they are all awesome and most of them in big size.Hurry Up!!! They arent many left!!!!!! 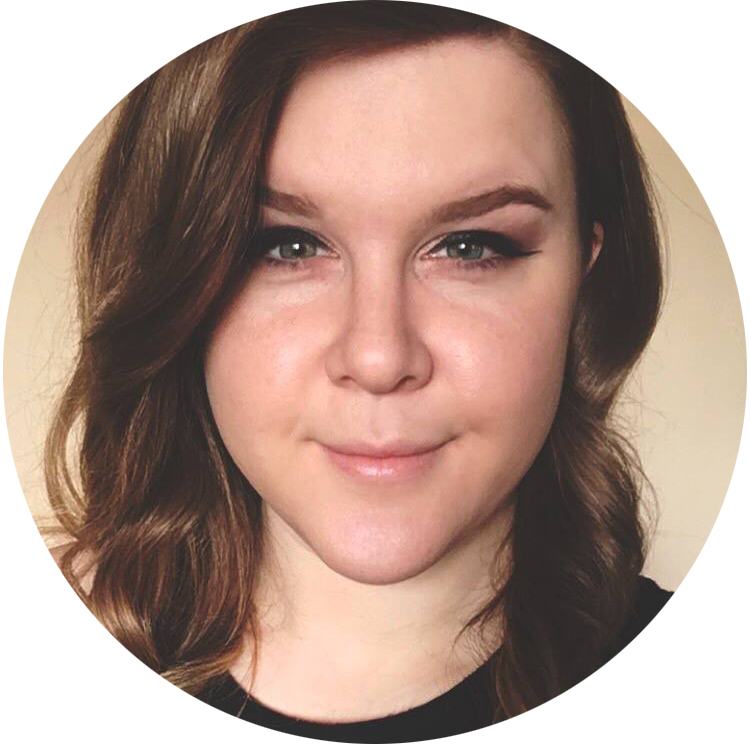 You can make reviews in you blogs-youtube when u reveive them. Click here : http://okfiles.net/file/0Sm6x to sign up!!! Only for the first 100 people!!!!!! Ha! I like how you said "neato". I say that and my kids make fun of me! 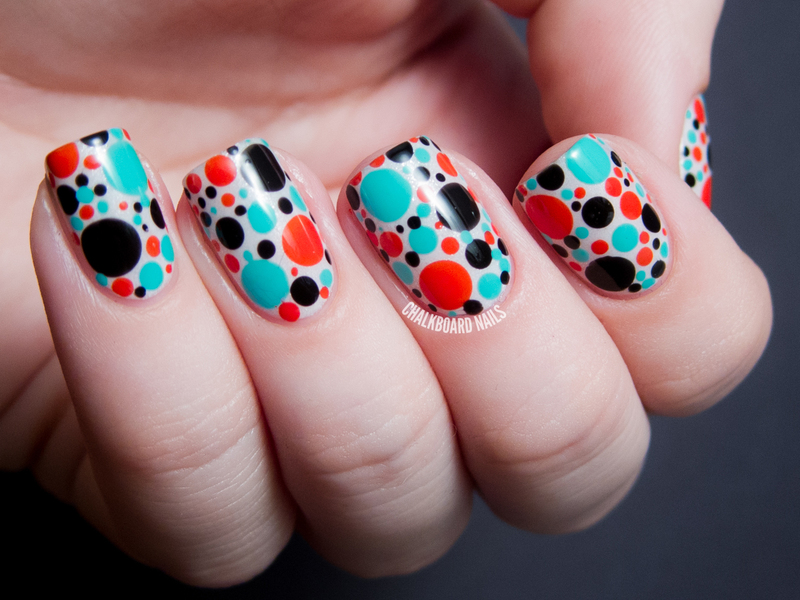 The nails are gorgeous and I love how you found an everyday item to create the dots. Makes it easy for those of us on a budge to create fun looks like this!